Paw-shaped car magnets featuring the phrase, ‘who rescued who’ are a common sight on the road, and our canine companions see frequent use as therapy dogs. Clearly, man’s best friend can have a big impact on our emotional state. But research shows that senior citizens, especially, may benefit from the presence of a furry companion. 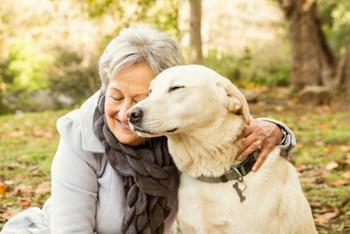 According to a study in the Journal of the American Geriatrics Society, elderly people who welcome a dog or cat into their lives may see a decrease in symptoms of depression or loneliness. Many organizations -- including the Pets for the Elderly Foundation and PAWS’ Seniors for Seniors program -- are centered around this very concept. Not only are dogs treasured companions, research shows they can help improve physical and mental health. What other benefits can caring for a pet offer the elderly? Pets can help seniors become more active. Getting outside -- with or without a dog -- has already been shown to have a huge positive impact on seniors’ mental health, as we’ve reported. But with a pooch along for the journey, walks can be even more beneficial. Seniors might find themselves out and about more often -- and with a cute furry friend in tow for social support, it might even become a little easier to make new friends. As a result, opportunities to be social may increase and depression and loneliness may decrease. From a physical health standpoint, playing with or walking a dog can be beneficial to seniors with arthritic hands and arms. Pets also force their owners to adopt a routine (feeding, walking, grooming, etc) -- this can help seniors stick to healthy habits and make them more likely to stay active. Studies show that seniors who own a pet have a lower pulse rate, lower blood pressure, and visit the doctor 21% less. Furthermore, the American Heart Association released a study showing that owning or interacting with dogs can help prevent heart disease. While the exact reason for the association remains unclear, it may be that healthier people are more likely to be pet owners or that people with dogs tend to exercise more, said Dr. Glenn N. Levine, a cardiologist with the Michael E. DeBakey Veterans Administration Medical Center in Houston and lead author of a scientific statement by the AHA which looked at the influence of pets on heart health. Levine notes, however, that people shouldn’t adopt a pet solely to reduce their risk of heart disease. “The primary purpose of pet adoption or rescue should be to provide the pet a loving home and to derive enjoyment from the pet,” he tells Heart.org. Indeed, one of the best reasons to adopt a pet is for the unconditional love and companionship. The elderly, in particular, can benefit from the self-esteem boost that comes along with being a pet's sole provider and caretaker. The licks and tail wags don't hurt, either. Should you allow your dog to sleep on your bed? Which companies are the most pet-friendly? How much does your dog cost you per year? What's in it for kids who help care for the family pet?